The photo above featuring fascinating hoodoos in Utah's Bryce Canyon National Park in USA. Hoodoos are erosional landforms that take shape whenever a relatively hard rock, such as limestone, overlays more readily erodible material, such as sandstone and or shale. The limestone acts to shield the softer rock from the elements, thus retarding the rate of erosion. This image belongs to the travel and nature stock photo library. This stock photo of Hoodoos Formations of the Bryce Canyon is available for licensing for commercial and editorial uses including websites, blogs, books, magazines, brochures and advertising. Restrictions may apply for images which contain third party copyrighted material or sensitive subjects. Photos of artwork are for editorial use only. 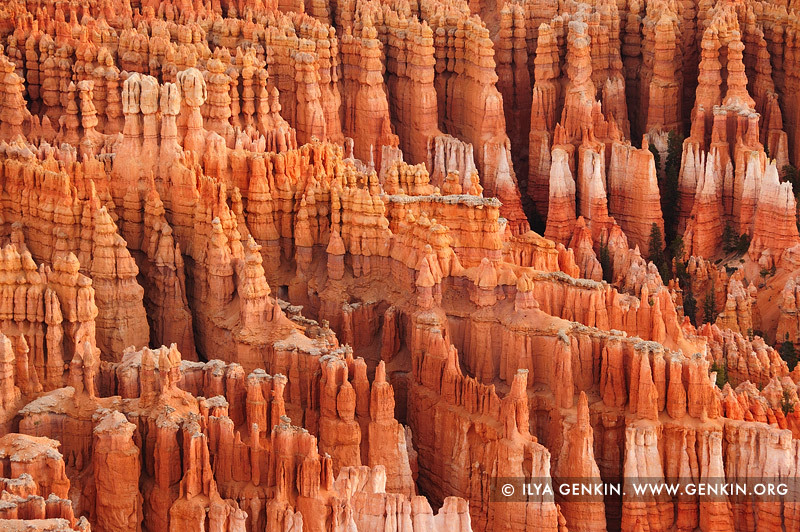 This image id US-BRYCE-CANYON-0011 of Hoodoos Formations of the Bryce Canyon, is copyrighted © by Ilya Genkin. This is not a public domain image.